Father Christos Christofidis was born in Nea Smyrni Athens Greece in 1953. His father’s name was Raphael (born in Adana, Asia Minor) and mother’s name was Garyfalia (born in Ioannina, Greece). Both parents are deceased. His parents immigrated to U.S.A in 1968 with their three children; two daughters and a son. Father Christos attended L.I.C High School in Astoria NY from 1968-1971 and graduated from Queens College NY in 1976 with a double major in Accounting and Economics. After almost three years in the retail business he started a career in the insurance field in 1979 until 1991. He married Joanna Tsarsis in 1980 (born in Limnos, Greece; father’s name George, mother’s name Aphrodite-deceased.) and they have three sons; Raphael, (married to Georgia Giannikopoulos), George and Matthew. 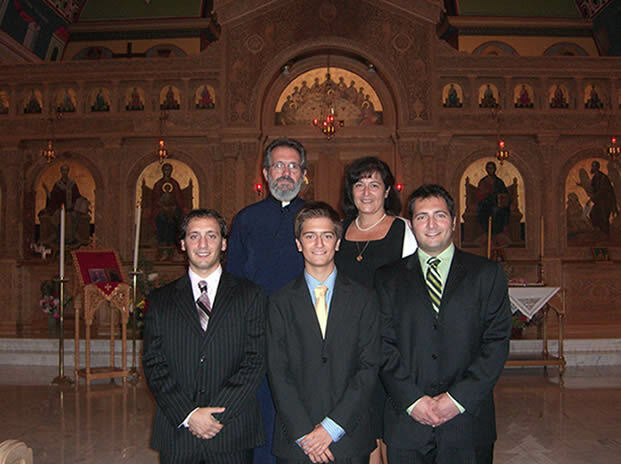 Father Christos studied at Holy Cross School of Theology from 1991-1994 and graduated with a Master’s of Divinity Degree. The first community he served was Dormition of the Theotokos in Springfield, OH from 1994-1996. His second community was Annunciation of the Theotokos in York, PA from 1996-2005. His third assignment was the community of the Annunciation of the Theotokos in Elkins Park, PA, July 2006-January 2014. He enjoys good conversations, and can be reached by email at fr.christofidis@holytrinitywilmington.org.